In many recent posts, I have been getting some great questions, suggestions, and ideas in the comments. I thought this would be a great tool to use as a suggestion form. This will allow our staff and team to gather information, in one location, of suggestions and ideas that come from our members among the community. 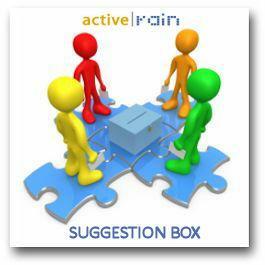 Collectively, some of the greatest advancements and upgrades on ActiveRain stemmed from a conversation, a Blog post, or a simple comment. There’s over 173,000 members here, and most likely, some of the “BEST” ideas and innovative creative minds, so we’d like to hear from you. In a future post, I’ll show you how to add a form like this to your Blog using Google Docs. This could be a contact form, a lead sheet, a fact sheet etc. There’s numerous ways I can see how our members might benefit from using a tool like this. Your information submitted here will be kept confidential.